After booking our river cruise tickets the day before through the travel lady at our hotel, we got up at 6:00 am, found some quick breakfast noodles, and waited for our transportation in the lobby of our hotel. 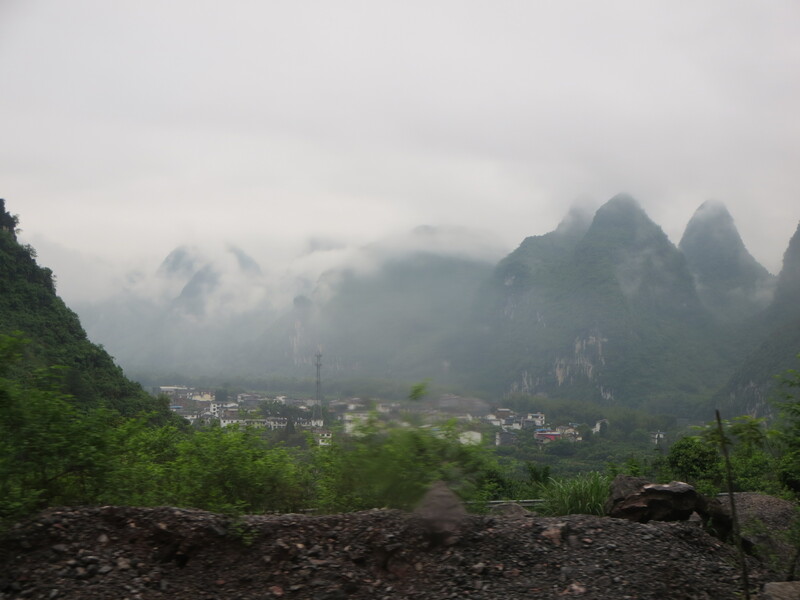 At 8:35 the bus arrived and took us into the Guilin countryside. The weather had been particularly crappy the day before and it looked like today was going to be much of the same. 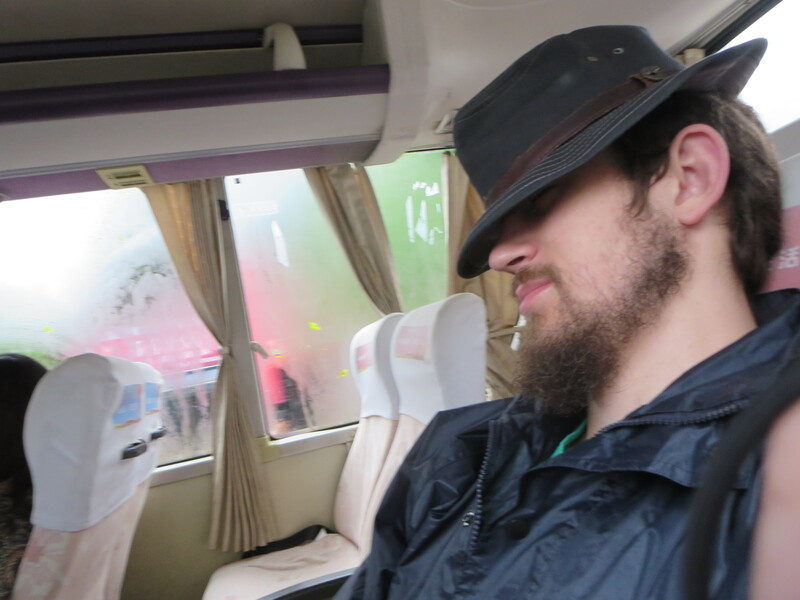 The hour or so trek began with a light snooze rather than rapt gazing out bus windows. Just look at Spenser, sleeping away as we drove further and further out of town. All of a sudden, these beautiful green peaks started appearing closer and closer to the road. Winding our way around these increasingly larger mountains and rice paddies, we made a turn and Spenser and I totally had a Keanu Reeves-style “Woah” moment. 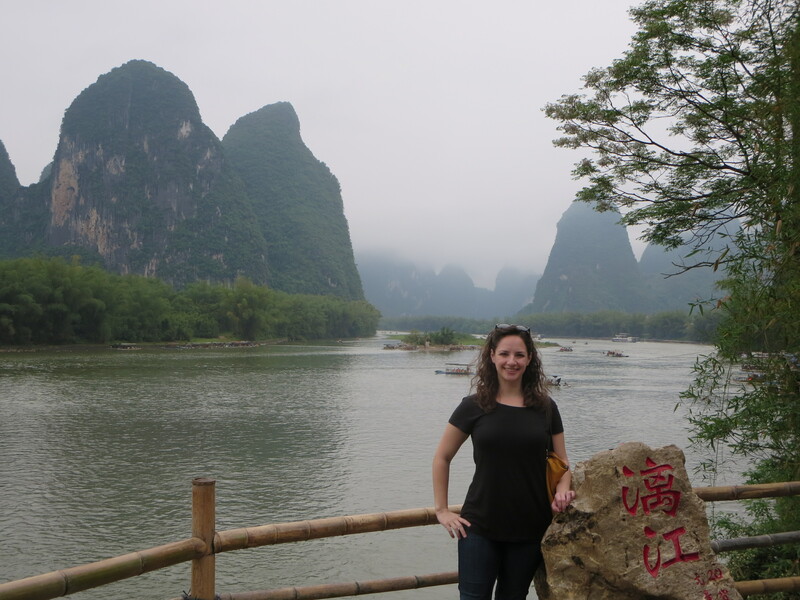 We’ve seen many pictures of Guilin. 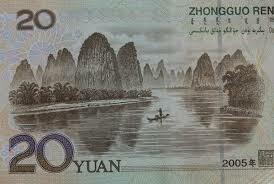 Hell, the 20 yuan note even has a picture of the Li River on it. Nothing we had seen could have prepared us for the majesty that stood before us. And I’m not using the word “majesty” lightly here. What we saw that day was truly majestic. Our bus stopped at the boat dock and, of course, I had to pee. (Warning: Chinese bathroom story. Read with caution.) About 50 other Chinese women also had to pee, so we made our way to the one and only bathroom where only 3 stalls had doors, one of the toilets in the closed-off stall was super broken, and the other 5 stalls had no door at all. But that didn’t stop the line of impatient women from doing what they needed to do! It was weird. What made it weirder was that, when it was finally my turn, the only one that opened up was a door-less stall (just my luck) and I had to do my “business” in front of 23 other women waiting in line. While wearing my overflowing backpack because there was nowhere to put it down. It was super weird. And awkward. And scarring. A memory that will remain with me forever. I love this picture. Her profile, the old lady trying to sell me something, the guy puffing away on his cigarette. Love it. 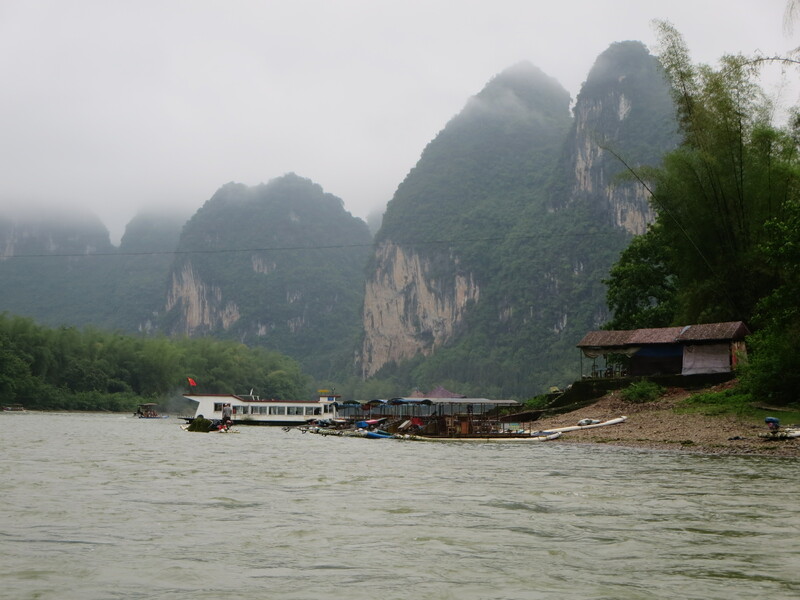 The Great Lijiang River Fleet! Now this feels like China. The boats made a very “putputputputput” sound. There were only 4 people to a boat plus the captain, so the trip was remarkably peaceful. We just floated along to the tchop, tchop, tchop of the boat’s motor, watching the girls sitting in front of us taking a million selfies, and enjoying the incredible scenery surrounding us. It was wonderful. As soon as we started to feel peckish, we pulled over to a very small dock for some lunch. Now our initial ticket said lunch was included so we ordered some sliced beef with green beans, overcooked scrambled eggs, rice, and a beer. It tasted fine but I didn’t care; it was free lunch! Only it wasn’t. Sure enough, a receipt was presented at the dock by an angry “waiter” who thought I was the crazy foreigner trying to rip him off. I apologized and tried to explain that I wasn’t trying to rip him off, I just thought we had a free lunch because our ticket said “lunch included.” So after I paid, I realized I became “the Foreigner you can take pictures with!” somewhere during my conversation with the waiter. Usually this gets annoying, but I was in a good mood and the ladies were nice enough to ask before they started taking my picture. So I stood there patiently while the gaggle of ladies (who totally saw me pee earlier, by the way), took their pictures with the foreigner. 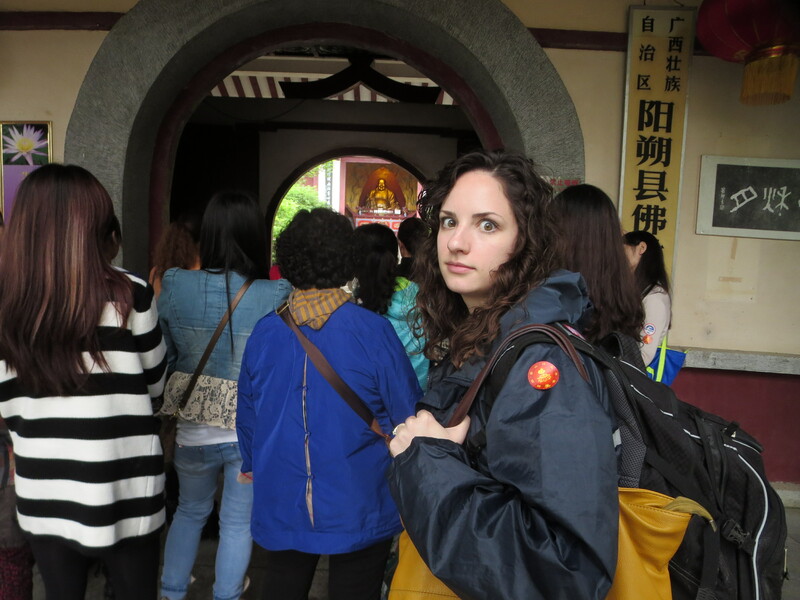 Luckily, I got pictures of my own to show you how it goes when you’re the only female foreigner on a Chinese tour (They weren’t that excited about Spenser though. It think the beard scares them away. *Editors note: I’m also always much taller, much more stern looking, and generally more imposing. Adrianna’s infinitely cuter by comparison.). All they say is “Hello!” and “Oh! 漂亮! 漂亮!” “Beautiful! Beautiful!” I usually respond with, “No! You’re beautiful! You’re the 漂亮!” and that always makes them laugh. Either they’re laughing out of awkwardness or I’m actually hilarious. I’m not sure which is more correct. Back on the boats, we floated a little further down the river before pulling over again, this time in front of a gigantic mountain that I think is super famous but I have no idea what it’s called. Like I said, our tour was all in Chinese so I had no idea what was going on most of the time, but I’m pretty sure I’ve seen this mountain before in ancient Chinese paintings. Spenser and I have been in China for a while now and we’ve also been to a few museums with large exhibits of centuries-old paintings. I swear, I thought the mountains that were always depicted in old ink paintings were made up. Imaginary. Totally not real. When we saw this mountain, all I could say was, “OH! I get it now!” The mountains are real, they only look fake because nature is just that impressive. I’m pretty sure ancient Chinese artists painted this mountain in particular because it looked totally made up, imaginary, and absolutely not real. Geology rocks! Carefully cropped pictures preserve the fiction that we were alone on this rocky beach. The ladies were SO excited. Twirling and everything. These guys could care less. Get them some cigarettes. Stick bird. I named him Billy. Many boats make this journey every day. “I need my picture with the foreigner here now!” I’m so popular. Spenser and I also found this incredibly scenic spot to be completely hilarious due to the sheer amount of “tourist crap” that was on this rocky riverbank. You could hold the fisherman’s bird stick! Dress up in traditional clothing! Buy fake jade jewelry! Wear this silly hat! Need a tiny bronze Buddha? They had those too! The best part about the river cruise was getting away from all of the fake stuff that you see on a daily basis living in China. Unfortunately, no matter where you go in China, that fake stuff will never be far away from you. At least the mountains were real. It’s nice to remember that genuinely awesome things still exist. After the riverbank fun, we finished up our river cruise and waited for a tiny car to take us back to the bus. It was about 1:30 and we were ready to get to Yangshuo, have a beer, and enjoy our new city. Alas, there was still a lot to see! Yes, the tour we signed up for was all in Chinese (it was more convenient than the English tour) and we knew that we were going to go see some other famous spots around Yangshuo before we were done. Seemed like a really good deal (especially when I thought we’d still get a free lunch). I was ready to go home at this point, but we had to go see the spot that’s on the back of the 20 yuan note first. Because we were still with our tour group of selfie monsters (seriously, how many pictures of your face do you need on your phone? ), each stop that should have taken only ten minutes took at least twenty. Stops of twenty minutes took forty-five. My patience was growing thin, but this spot seemed pretty cool. 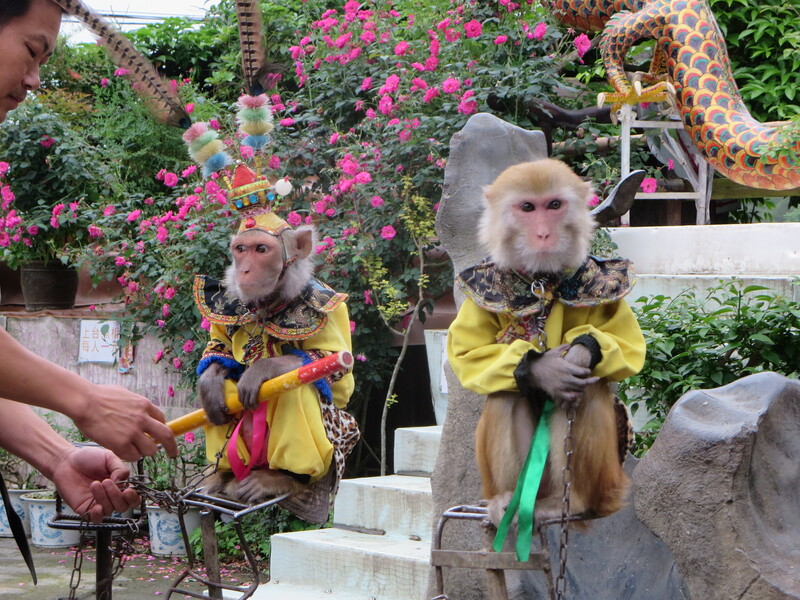 Fancy monkeys, a dragon, cool rocks. Very China. We got on the bus again and went to a Buddhist temple (that I assume is also famous) but it just seemed to me that it was a money trap. Donation spots were everywhere and there were a large number of tour buses, much like our own, in the parking lot. By this time, I’m done. I am totally done. I’m tired. I’m hungry. I don’t know Chinese so I don’t know what’s going on. 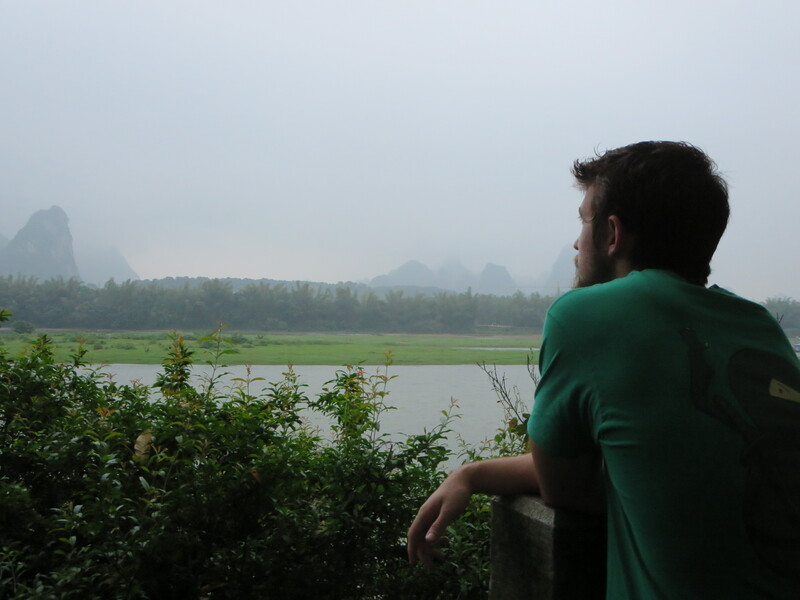 I want to get to Yangshuo. But look at the pretty temple, Adrianna! Yes, it’s pretty. I know. I’ve been to many temples. I’m tired; let’s get moving, people! No! We’re not done yet! 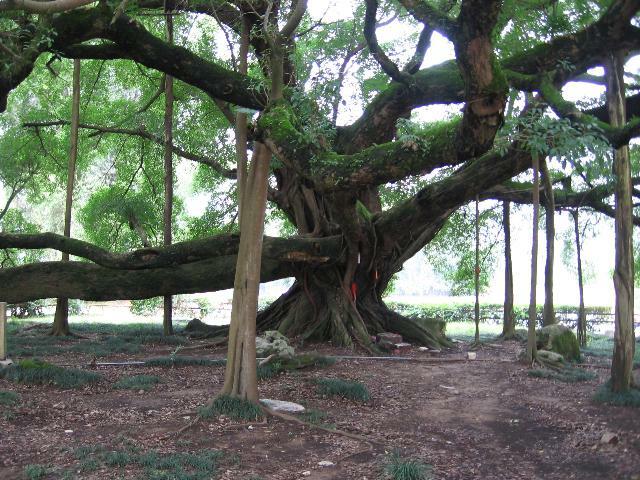 We have to go see the big Banyan tree! Yay! No, not yay. Yes, it’s a big tree, but I’ve seen many big trees. I used to live in a city where live oaks grow everywhere. It’s just a large banyan tree. I was so tired of being part of a tour at this point that I forgot my camera in my coat on the bus, but enjoy this image from google of the big tree. 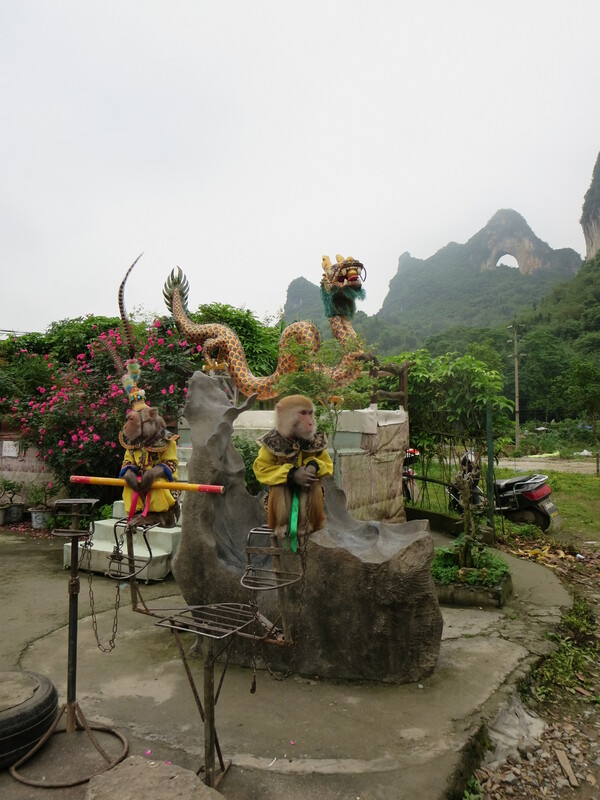 At 4:00 in the afternoon, we got back on the bus and finally went into the city of Yangshuo. Exhausted and stinky, Spenser and I walked to our hotel, checked-in, and immediately passed out. Our long day was long. Beautiful, exciting at times, boring at other times, but overall just long day. After a glorious two hour nap, we stepped outside for dinner and caught this view across from the hotel. Spenser and I do not do well in tour groups. We usually prefer to be left alone and adventure at our own pace. However, would I do this tour again? Absolutely. I’d skip the stops at the end, naturally. 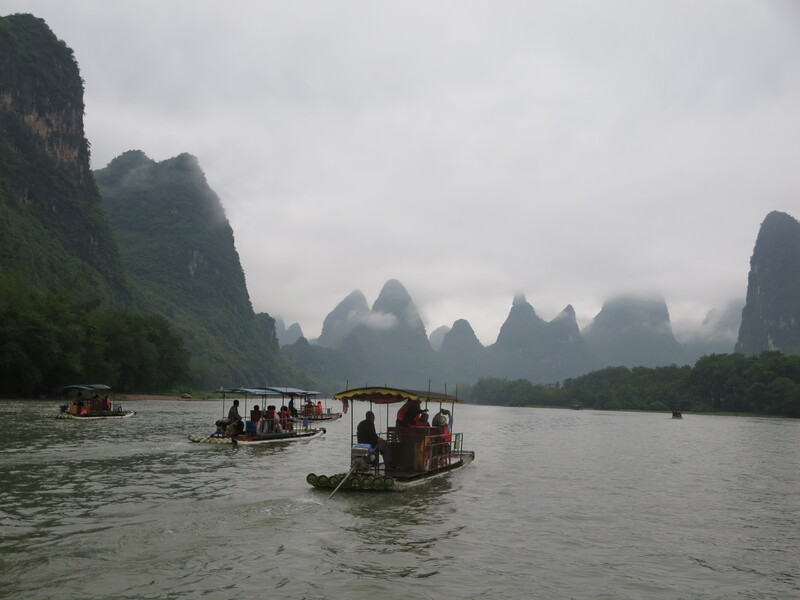 To cruise down the Li River in a tiny boat among the alien planet-like mountains was an experience of a lifetime. During our float, it didn’t matter that I didn’t speak Chinese or that the weather was less than perfect; it was still the best river cruise I’ve ever been on. A truly unforgettable landscape. 10/10 would do it again.